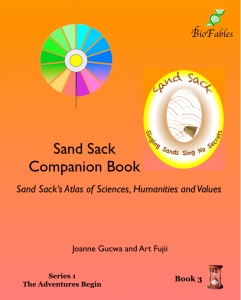 Click on a BioFables book image to order from CreateSpace (an Amazon company). For more information on each book, click on the title in the Description column. You’ll find an expanded description and a table of subjects covered in each book with links to additional web-based resources on selected subjects. 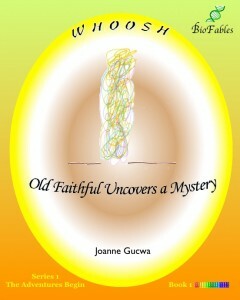 Whoosh; Old Faithful Uncovers a Mystery. A whirlwind visit to some of the geographical wonders of this famous National Park reveals more than geysers and paint pots. 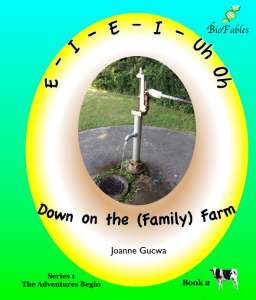 E-I-E-I-Uh oh; Down on the (Family) Farm. Learning how to feed chickens and milk a cow are ordinary, everyday experiences on a farm. Some experiences, though, are definitely out of the ordinary, as seven-year-old Mallory soon discovers. 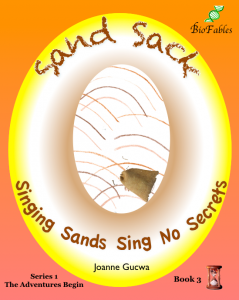 Sand Sack; Singing Sands Sing No Secrets. There’s more to the hills of sand than anyone could have anticipated. Especially when they shift over time. And then there are insect-eating plants, tree graveyards, and a real-life demonstration of the food chain in action. 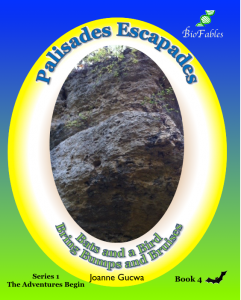 Palisades Escapades; Bats and a Bird Bring Bumps and Bruises. Catching fireflies is fun. Cicadas, too. But what happens when you mix a dog, a cave, and some bats? 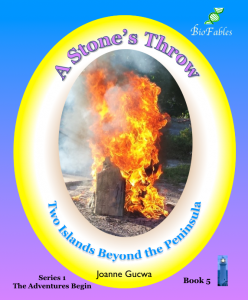 A Stone’s Throw; Two Islands Beyond the Peninsula. A fish boil, a treasure map, a ferry ride across Death’s Door and more! 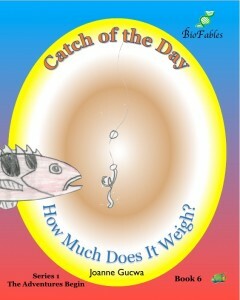 Catch of the Day; How Much Does It Weigh? What do a water trampoline and Newton’s Laws of Motion have in common? How much does a sack of stuff weigh? Can a fish tell time? Find out! Pumpkins, Mazes and More. Birds reveal direction, Grandpa Mike’s announcement surprises everyone, and the best pumpkin decorations don’t always win a prize. A Thanksgiving Project. “Tis better to give than receive, and so much better when the giving is done in secret. Everybody wins. A Rocky Mountain Christmas. Looking for rescue dogs leads to a scary situation; a glimpse of a wild fox; family parties; a snowy “beach” and panning for gold are some of the many adventures in the thin mountain air. Mammoth Cave. Underground rivers, blind fish, and remembering the difference between stalactites and stalagmites are just a few of the discoveries awaiting the Maloney family. Ninja Mom. Japan is a whole lot farther than Yellowstone, and not only in distance. Join the Maloneys as they discover differences and similarities in culture, food, and other features of Yokohama and beyond.